FOXPRO® Deadbone DB-1 Electronic Predator Caller Great electronic predator call at an affordable price Pre-loaded with 15 high-quality sounds Single horn speaker delivers crystal-clear sounds Ideal for beginners, the FOXPRO's Deadbone DB-1 Electronic Predator Call features 15 high-quality sounds at an affordable price. 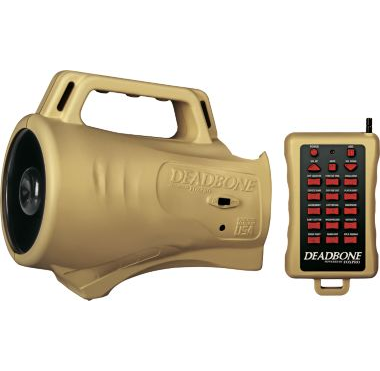 Rugged, lightweight ABS housing features a single high-efficiency horn speaker that delivers crystal-clear sounds to bring predators in from a distance. Operates on four AA alkaline or rechargeable batteries (not included). Long-range remote controls sounds, mute, volume, power on/off and also features an add button so you can play two sounds at once for a more realistic calling sequence. Remote runs on a 9-volt battery (not included). Manufacturer's limited one-year warranty. Made in USA. 8.1"L x 4.45"W x 5.8"H. Wt: 1.5 lbs. with batteries.